…is anyone else kind of tired of (and, honestly, slightly annoyed by) that question these days? Sure, momentum is a real part of a championship team’s success. Momentum shifts can be powerful. Sometimes, even more powerful than A+ strategy. Just ask a team that’s hitting well, pitching well, winning when they seem to be on the brink of losing. Basically, ask the Brewers. But, momentum is also a very fickle thing. How many times have we seen a team chip away, load the bases on a couple base hits and a walk, then fail to score? Just when it seems the momentum is ready to swing wildly in favor of that team, something slams the door and drains the momentum tank all dry at the same time. For the last month, the stories surrounding the Cards have been structurally the same, simply subbing in new “if only”s based on what’s worked and what hasn’t. If only we could pull of an emotional win. If only Mark Ellis (or Jhonny Peralta, or Allen Craig, or Peter Bourjos, or … you get the idea) gets going. If only John Mozeliak would bring back Kolten Wong, then force Mike Matheny to play him everyday. If only Oscar Taveras would get called up already. Problem is, none of the things that theoretically could turn the tables in the Redbirds’ favor have worked. This is kind of a downer of a post for the night after the Cards took the second of three from the Cubs. Sorry about that. But, the reality is, even wins feel a little less exciting lately, because they don’t seem to be producing any lingering changes. Despite winning back-to-back games against the Cubs this week, 13 other times this season a win was followed by a loss. Only once have the Cards won more than two games in a row (four in a row between 4/12 – 4/15). It’s puzzling, to say the least. That has been the M.O. for this team so far in 2014. They’re puzzling. 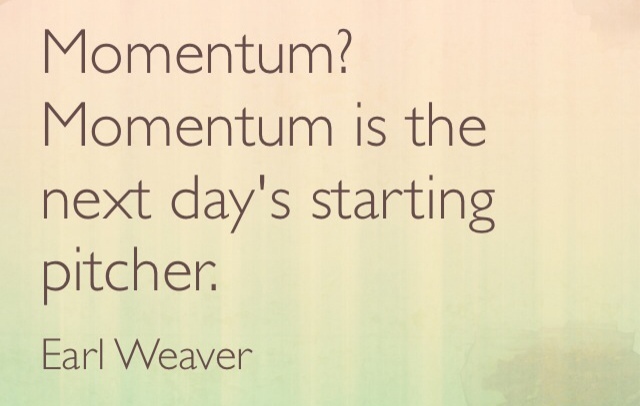 And “momentum” seems to mean little. I think Matheny hit the nail on the head in his postgame comments today when he acknowledged this “if only this, then that” mentality was stemming from a flawed message to the team. Instead, his new message is, “It’s a grind.” That’s a far more realistic approach to a 162-game season than to expect momentum to flip on like a light switch. I mean, I’d love for the Cards to tick off 10 or 15 wins in a row. That’d be great. Is it likely? Not so much. What is more likely, though, is that “momentum” provides a boost now and then, and hard work does the rest. Perhaps it’s a change in the team-wide message. Perhaps it’s a couple guys getting right and staying that way. Perhaps it’s simply grinding out every at bat, every day until it gets easier. I’d just really like to not have to depend on “momentum” to see my Cardinals succeed.